Deuteronomy 6:4-9 - 4) Hear, O Israel: The Lord our God, the Lord is one. 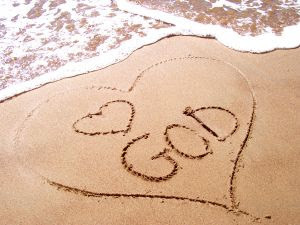 5) Love the Lord your God with all your heart and with all your soul and with all your strength. 6) These commandments that I give you today are to be upon your hearts. 7) Impress them on your children. Talk about them when you sit at home and when you walk along the road, when you lie down and when you get up. 8) Tie them as symbols on your hands and bind them on your foreheads. 9) Write them on the doorframes of your houses and on your gates. I said it as ultimate command as I feel that when you love God, everything that you see is beautiful, there is no pain and your life will be filled with great happiness. We are assured and secured with Him, ready to embrace us for any failures and victory, ready to listen to us when we want to talk or even when we are crying. He loves us so much that we should also love Him above all by following his orders, avoid making sins, letting Him to lead us going to His path and listen to Him when He speaks to our heart. I am blessed that I have a mother who is very close to Him that she literally displayed God related items in our entire house and yes even in the gate. Since our childhood, we knew His existence and we always acknowledge His presence in our lives. Matthew 22:37-38 - 37) Jesus replied: "Love the Lord God with all your heart and with all your soul and with all your mind. 38) This is the first and greatest commandment. It is very clear from the above verse that loving Him is the greatest commandment. All is possible with Him. They are saying that we are playing the game called life, I will say that love is the greatest weapon/advantage in this game. So let's use it, we can overcome any troubles when we love Him and nothing can go wrong.